July proved to be nearly the coldest on record in nearly a hundred years. Now, 6 days into August, our unseasonably cool weather continues, and today we have a chance of seeing the coolest August day since record keeping began in 1875. Since weather records began, the official high temperature reading at Lindbergh Field has never been lower than 66 degrees on an August day. The National Weather Service thinks we may see a high of 65 today, making it the new record. I’m calling for a high of 68, just shy of a new record “low high.” In any case, this weather pattern will stick with us a few more days. We’ve seen sunshine each day, but a persistent trough of low pressure off our coastline has deepened our marine layer. Grey skies looming at the coast longer than usual have mean low daytime highs all around. Jodi Kodesh gives you the Morning Forecast for Friday, August 6, 2010. 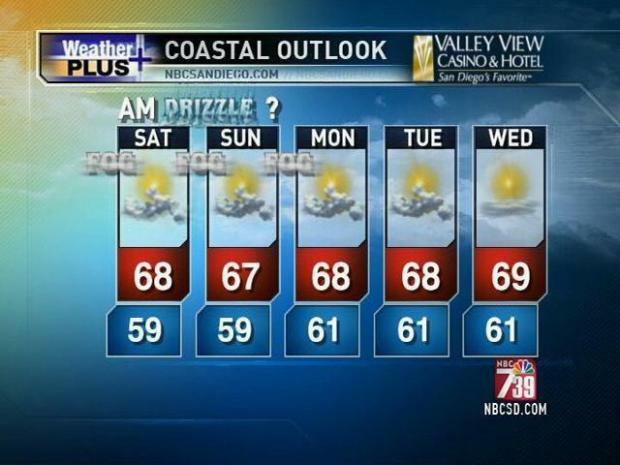 Through the weekend, thick coastal low clouds will bring a chance of early morning drizzle. Only partial clearing at the coast will keep us in the mid to upper 60s. Inland areas will be sunny, but on the mild side as well, with the thermometer only climbing to the upper 70s. The trough will move eastward and out of our region by next Wednesday, lessening the marine layer, though our temperatures show no immediate sign of climbing. We will remain well below our seasonal average throughout the entire next week.